Most art and history enthusiasts are well aware that historical objects need to be regularly monitored and conserved. But what about historic structures? How can conservators, architects, and historians work cooperatively to preserve the houses of the past for historians of the future? This year, Winterthur is learning the answers to those questions as we renovate our exterior. The main goal of the yearlong project is to replace the 410 Plexiglas windows and approximately 800 wooden shutters on the exterior of the building. Careful attention has been paid to the changes that were made over the course of the house’s construction and, as put by Winterthur conservator Lauren Fair, the renovation will “tell again the story of manufacture and design change from one building campaign to the next.” These repairs and replacements will allow visitors to be able to see into the windows to the window frames, or muntins, and will restore the building’s exterior appearance, in keeping with the original aesthetic. Along with the windows, the wooden shutters will be replaced with ones made from more durable material. 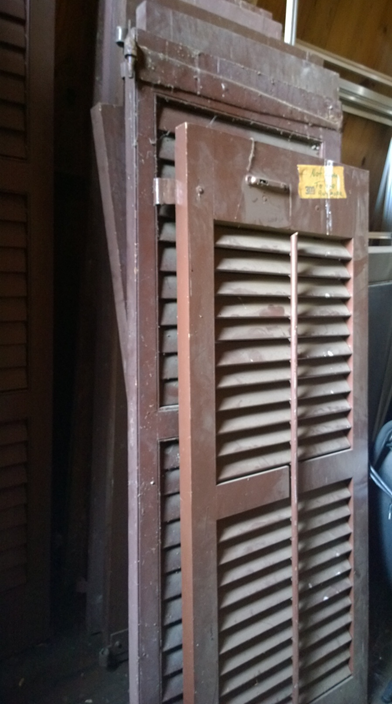 Although the original shutters were regularly cleaned and repaired throughout the year during the 1960s and 1970s, this project marks one of the most significant efforts to maintain these shutters. 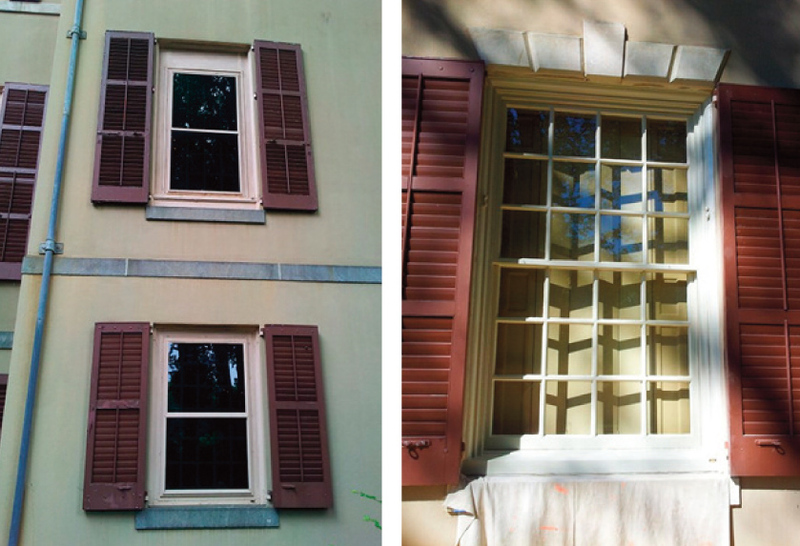 The team at Winterthur has discovered at least 17 different variations of them, ranging from what are thought to be the original, functioning shutters from the part of the house built in 1902 to decorative ones installed several decades later. As with many parts of this renovation process, the progression of shutter variation around the house has shed light on some more debated parts of the house’s construction over time. Although window and shutter repairs were the focus of this renovation, the access the scaffolding has provided to the upper stories of the house has also allowed for an assessment of the overall structure and preservation of the building. Some of the most noteworthy aspects of Winterthur’s exterior and interior are those elements that were taken from or inspired by the Port Royal House, which was originally built in Philadelphia in 1762. Actual architectural elements from this house can be found reinstalled in various rooms at Winterthur, but several components on the exterior of Winterthur are also taken from this house or were modeled after its architectural elements. For instance, the dormer brackets that frame many of the windows at Winterthur were created in the latter manner and they have become part of the most recent renovation project. Conservators and staff will be removing the original brackets in order to properly treat and conserve them. At this time, no decision has been made as to the fate of these objects, but it is likely that the originals will be stored and replicas will be put in their place. The renovation project has also given our staff unprecedented access to some iron fencing from the Port Royal house, which now lines many of the ridges of Winterthur’s roof. Our conservation staff was particularly excited by this discovery and will be treating the ironwork over the next several months. The treatment will include the removal and replacement of the former coatings with new, more corrosion-proof ones. 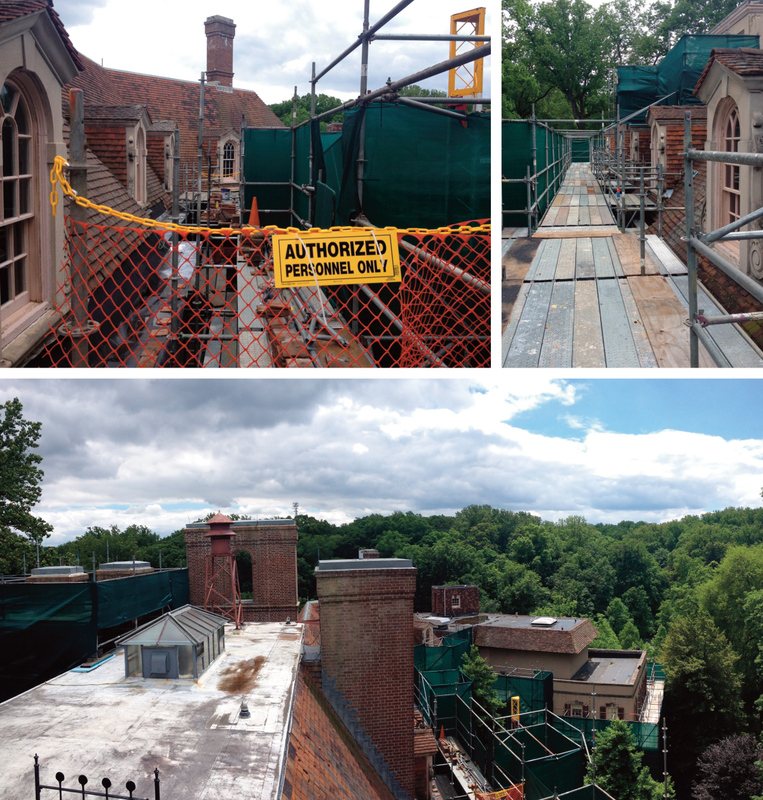 While the scaffolding remains up for the renovation, several chimneys will be repaired or reconstructed and the gutters will be replaced. In order to install new gutters, several roof tiles will need to be removed and replaced. These pieces are the original tiles that Henry Francis du Pont acquired from the Ludowici Roof Tile Company, which were created in the Italian clay tile-making tradition. One of the final stages of the renovation will be the installation of new, exterior lights that will light up Winterthur during the nights and darker months of the year. In its heyday, Winterthur was a beacon of culture, entertainment, and historic preservation. 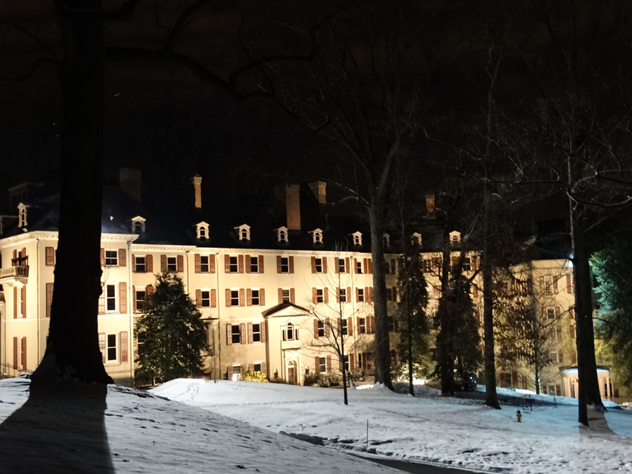 It is our hope that with new lighting, shutters, and repairs, Winterthur can continue to illuminate the days and nights for generations to come. For ongoing updates on the house renovation, please visit renovation.winterthur.org. This entry was posted in Architecture, Art Conservation, Behind-the-Scenes, Conservation, House and tagged H. F. du Pont, Harry du Pont, Henry du Pont, Henry Francis du Pont, HF du Pont, Italian clay tile making, Lauren Fair, Ludowici Roof Tile Company, Port Royal, Port Royal House, Regina Lynch, Winterthur, Winterthur conservation, Winterthur Garden, Winterthur Library, Winterthur Museum, Winterthur Museum Garden & Library, Winterthur renovation, Winterthur scaffolding. Bookmark the permalink. Looking at the picture of the before and after windows, I assume there is tempered glass storm window on the inside of the building to prevent any flying objects from penetrating into the building. Wow! That must have been some huge undertaking but I’ll bet it was all worth it in the end!